Two years ago, the German Power Metal band BRAINSTORM made a fabulous return to form with “Fire Soul”, which you can read here. The skills of Mr. Achim Köhler were vital in bringing the band’s sound back to life. Of course, it takes more than a producer to create a good album. Thanks to the renewed connection – never change a winning team – the band can continue where it left off a few albums ago. Now, anno 2016, the follow-up is out and again handled by Mr. Köhler: “Scary Creatures”. The band’s eleventh album begins with an orchestral intro, reminiscent in a way of MEGADETH’s “Symphony Of Destruction” or even a little of the hidden intro, in negative time, of KAMELOT’s “The March Of Mephisto”. Of course, to follow the theme, BRAINSTORM made its intro darker, scarier, … building up until their characteristic music power bursts out of the dark! Massive, obliterating, and more. With the typical slamming kind of Power Metal, the song sets forth, led by Andy B. Franck’s passionate vocals. The melodic bridge/pre-chorus (with atmospheric backing by the keyboards) link up smoothly with the massive-sounding, pounding chorus. The layered vocals add to the voluminous sound. The solo, over halfway, is nicely done. Nothing extravagant, nothing wild, but smoothly laid over the basic track. After that, the chorus returns on repeat, which is a trick they applied in practically every song. I can understand the reason for repeating a certain part, but applying the same trick over and over again is being lazy and in the long run it gets annoying to listen to. Despite that, this first song is killer! Next is “How Much Can You Take”, which begins with a melodic line, followed by the rhythm section. It’s a simple song, but with tight, dark, and groovy verses. Andy also sings a bit lower, reminiscent of old(er) times. The chorus stands out again, thanks to the massive sounding backing vocals. I like how the drums suddenly change a little in the next round of verses, as Dieter applied a dancy twist to his playing. The solo moment’s music reminded me a little of “Soul Temptation”, at least in the first part. Afterwards, though preceded by it’s business as usual, i.e. the chorus on repeat. Another highlight, without the smallest doubt! “We Are” begins with pounding drums and the room echo, very nice effect here. When the heavy guitars come in, it’s heaven on earth! Power! Eargasms! Play it loud! The verses, in a first instant, feature only vocals, bass and drums. I must say that, while it’s typical for him, Andy sound a bit forced here. Full musical and vocal power join forces in the melodic bridge, which could have come from, for example, a PRIMAL FEAR or SINNER song, but more so in the grand, hymnic chorus. Like before, it sounds massive, not in the least because of the backing vocals. What a contrast with the verses, which then are played with full instrumentation and heaviness. The solos, another strong point of this band, are again very well done. A little later, there’s a children’s choir, clean music and marching drums, while Andy opts for a tell-sing style. The whole rebuilds to full melodic power, especially with the keyboards coming out from the back and into the chorus, onwards to the end. Buckle up then for the direct attack of “Where Angels Dream”, because the contrast between the title and the music couldn’t be bigger. 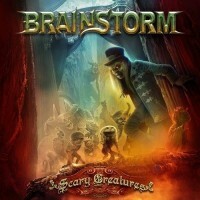 BRAINSTORM delivers the goods with vicious, ferocious guitar work and pounding drums. Thundering verses (with the obligatory passionate vocals, of course) contrast a little with the slower, melodic bridge, while full melodic input (incl. layered vocals) is reserved for the chorus. The songs thunders onwards nicely as the solo part is due. No need to mention the ending, see above. The title track, “Scary Creatures”, is a midtempo song. Here too, Mr. Köhler applied a massive sound, while orchestral arrangements operated frm the back, creating a dark and attractive setting. However, it’s again the guitars that dominate the structure, supported by the drums. Andy’s singing also sounds a bit darker, to fit the mood, but also a bit forced (as is custom with the man). The orchestral break later allows for a sort of resting point. Upon rebuilding, the power of BRAINSTORM’s Metal erupts and in come the solos. If you were asking if there was anything fast on this album, then “Twisted Ways” is the song you seek. Speedy/ier Power Metal, reminiscent of JUDAS PRIEST’s “Painkiller” album. The pounding drums cannot be ignored, neither can the rest of the band be. As accessible as it may be, this song is also a highlight. The chorus reminded me, in one way or another, of BLOODBOUND, the Swedish Heavy/Power Metal band. Speaking of accessible, also because the music sounds lighter, here’s “Caressed By The Blackness”, which, at least to my ears, sounds like a Hard Rock song in a heavier version. Andy’s singing contributes to that impression. The drums change a little in the chorus, while the backing music is added to inflate the song, to make it sound grand. But the end result is good, make no mistake. It’s a somewhat different story in “Scars In Your Eyes”. On offer is the typical BRAINSTORM slamming, so to speak, in a dark and vicious jacket. The melodic bridge has a dramatic feel, well expressed through Andy’s singing. The chorus, on the other hand, contains more musical power, although the backing vocals help in making it sound big. This is, all in all, a good song, but lacks that special touch of the previous songs. Is “Take Me To The Never”, when just looking at the title, the prequel to “Into The Never” (on the “Metus Mortis” album, 2001)? Did BRAINSTORM listen to AMON AMARTH’s classic “Pursuit Of The Vikings”? The starting theme, which returns a little later, does sound like a variant to that song’s main riff. Or are my ears fooling me? The rest of BRAINSTORM’s song is filled with straight-forward, chugging Power Metal of very good quality. Like before, the majority of the melodic side comes out in the pre-chorus and in the dark, voluminous chorus, which again contains layered vocals, another trick applied multiple times. The song itself is the last highlight, in my opinion. All ends with “Sky Among The Clouds”, another accessible song, meaning it’s Metal, but not as heavy or aggressive as the others. Melody is key in the intro, delivered by guitars and keyboards. When the song takes off, it’s all about firm and tight Metal. The verses consist in a first instant of vocals, bass, drums and keyboards, offering light melodic support. Full power is unleashed in the catchy (I must add) pre-chorus, which links up smoothly with the chorus, where the guitars continue to rule. Special moment here: the calm bridge later on, preceding the solos. No need for many final words: “Scary Creatures” continues where “Fire Soul” left off. BRAINSTORM deliver the goods once again and show they are still a force to reckon with. Heavily recommended material!